ARCHIVED TOPIC: The Essence of Davis ! 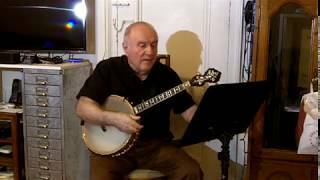 "The Manhattan Minstrel" Eddy Davis playing and singing a 1931 song written by Harold Arlen and Ted Kohler. It was first recorded by Cab Calloway - introduced in the "Cotton Club" show "Rhythmania". There is a famous solo by Louis Armstrong. Davis is playing his Custom OME 12' head - 17 fret neck Tenor Banjo. Ok, I'm definitely working on this one today. 'Beautiful job Eddy. Wonderful as always! And, as always, such amazing tone. Really makes me think hard about getting something with a 12” pot; love the warmth. I believe I'll work on this one too Eddy. She's a beauty in your hands. Tony, good to hear from you. Been missing you.